End users should understand ISO 15156 requirements to select the optimal material of construction of a fluid system component. Producing fluid system components that comply with all aspects of ISO 15156 requires the use of high quality raw materials, careful testing, and prudent choice of manufacturing methods. Alloys must have gone through a controlled solution annealing process, and their microstructural quality must be assessed with tests such as ASTM A262, which probes austenitic stainless steels for intergranular corrosion, or ASTM A923, which qualifies duplex stainless steels for absence of detrimental intermetallic phases. Austenitic stainless steels should be free of martensite and contain ideally no, or at most 2 percent, ferrite because these phases are more susceptible to hydrogen embrittlement than austenite. A sufficient number of hardness measurements must be performed and an average hardness value calculated, which must not exceed the respective allowed maximum value. No individual hardness reading is allowed that is greater than 2 units on the Rockwell C hardness scale above the allowed maximum hardness. When components are welded, care must be taken to perform hardness measurements on the welds following the procedures described in ISO 15156. Where solution-annealed materials are required, any cold drawing of bar or cold rolling of plate must be avoided. Cold deformation of surfaces is acceptable only if it is caused by processes such as burnishing that do not impart more cold work than typical machining operations. Identification stamping with low-stress stamps is acceptable, but sharp V-stamping should not be performed in high-stress areas. Choices surrounding material selection and manufacturing of fluid system components for service in sour gas environments are complex. End users must define the prevailing sour gas service conditions, including those of steady state processes and of potentially unintended exposures. Beyond material properties, several factors affect the susceptibility of a material to cracking in sour fluids: H2S partial pressure, in situ pH, chloride concentration, presence of elemental sulfur, temperature, galvanic effects, mechanical stress, and time in contact with an aqueous solution. 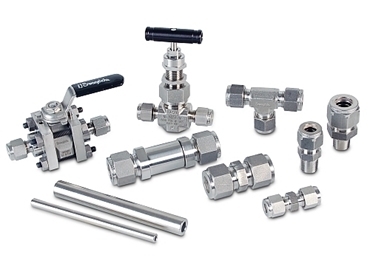 When a customer orders a specific valve, fitting, or other fluid system component for sour gas service, the manufacturer should perform a product review in which all wetted parts are evaluated against standard requirements, e.g., for type of material, manufacturing processes, and maximum hardness. Such a review ensures the products selected for sour gas service meet ISO 15156 requirements, as well as the customer’s requirement for durability, excellent performance, and reliable service.